JAMES “FRANK” BOATRIGHT, age 92, of Main St., Whitesburg, Georgia passed away Sunday, January 4, 2009. He was born May 13, 1916 in Carroll County, Georgia the son of the late Ida Pearl Bachelor Boatright and James Grover Boatright. Mr. Boatright was a retired employee of Nova Products, was an avid gardener and enjoyed wood working. 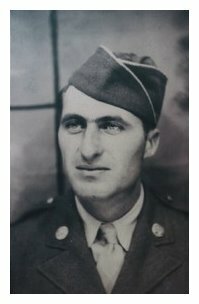 He served his country with distinction in the U.S. Army during WWII as a part of the tank corp. serving in the European Theatre. Besides his parents, he was preceded in death by his wife, Alice Duke Boatright; brother, W.C. Boatright (who was a casualty in WWII) and sisters, Velma Crawford and Marie Sailors. Survivors include daughters and sons in law, Elaine & John W. Sauls of Villa Rica, Ga., and Tanya & Ed Bradberry of Franklin, Ga.; sister and brother in law, Lucille & Render Dyer of Carrollton, Ga.; brother and sister in law, Cecil & Sybil Boatright of Whitesburg, Ga.; grandchildren, Eric & Debbie Sauls, Nathan & Jane Sauls, Curt Sauls, Chuck & Ginger Harper, Chad & Kim Harper and Keri & Chris Denney; also 13 great grandchildren. Funeral services will conducted Thursday, January 8, 2009 at 2 PM from Martin & Hightower Heritage Chapel with Bro. Jimmy Henry officiating. Music will be provided by Wayne Harris. Pallbearers will be Chuck Harper, Chad Harper, Chris Denney, Eric Sauls, Nathan Sauls and Curt Sauls. Interment will follow in Carroll Memory Gardens. The family will receive friends at the funeral home Wednesday from 5 until 8 PM. Messages of condolences maybe sent to the family at www.martin-hightower.com. Martin & Hightower Heritage Chapel of Carrollton has charge of the arrangements. Visitation was held Wednesday January 7, 2009, at the Martin & Hightower Heritage Chapel. The funeral was held Thursday January 8, 2009, at Martin & Hightower Heritage Chapel.